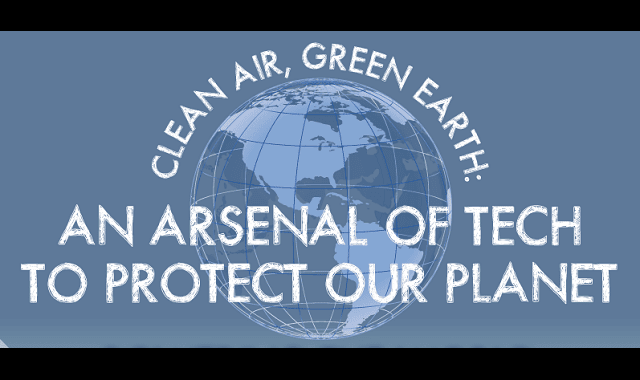 Arsenal of Tech to Protect Our Planet #Infographic ~ Visualistan '+g+"
Keeping the air clean, the Earth green and our waters blue is as important as ever for consumers, corporations and citizens in general. Since the Industrial Revolution, our planet has become more and more dependent on technology and the energy that drives it. To power our homes, businesses, schools, public places etc. we turned to coal and other environmentally-detrimental power plants, to fuel our cars, trucks, buses, motorcycles etc. we turned to fossil fuels such as oil. These methods are effective but non-renewable and have disasterous long and short-term effects on our environment. In this modern age, new technologies are the answer. Zero emission power plants such as wind and solar are cleaning the air while hybrid, electric and hydrogen cars are revolutionizing the way we drive. Make environmentally-friendly choices and protect our future!